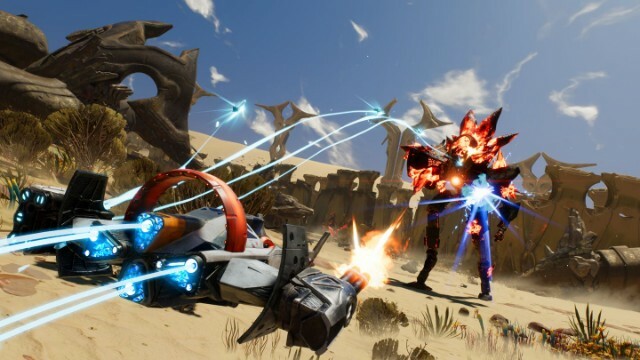 Starlink: Battle for Atlas sees you taking charge of a group of interstellar pilots, travelling the galaxy, exploring the Atlas star system and fighting back against the evil Grax and the Legion that he has built. As a journey, it’s a great one that is full of intrigue… but let’s not beat around the bush – it’s the toys we are here for, and in that respect, Ubisoft have pulled one out of the bag. 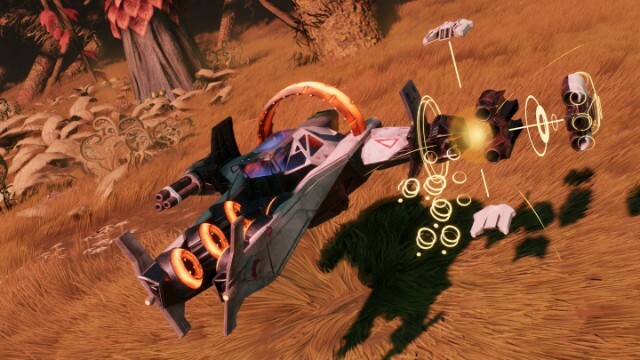 Starlink: Battle for Atlas is the latest title to attempt to bring toys to life, and from the get-go, it is the addition of starships, pilots, wings and weapons that sets this title aside from the rest. However, it would be wrong to put our sole focus firmly on that aspect of the game, as what Ubisoft have managed to produce in terms of actual game content is very nearly right up there with their other blockbusting experiences. Yep, you’re hearing me right, Starlink is nearly as good as the latest Assassin’s Creed adventures and it is nearly as addictive as the last Tom Clancy tale. In fact, I’ve been astonished at how good it actually is as ‘a game’ – and that’s without taking the modular toys aspect into account. 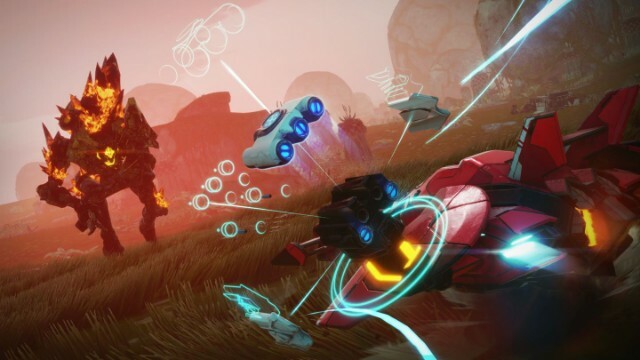 Starlink: Battle for Atlas drops you into the role of the leader of a group of pilots, before pushing you seamlessly through the galaxy, and on to a number of exotic alien worlds as the glorious narrative plays out brilliantly from the off. Without a word of a lie, you will find yourself fully immersed in this scientific galactic saga, getting involved with plenty of conversational opportunities to make new friends and relying on cold hard shooting to take down enemies every step of the way. Gameplay-wise and Starlink splits itself across a number of mechanics, most of which are highly interesting affairs that allow for huge immersion; after all, getting properly involved in the finer details of this game is what it is all about. See, piloting your ship across the face of the seven stunning planets that are included in the Atlas system is a joy, twisting and turning as you build up speed to navigate your way across its face with ease. It must be said that the ship controls are a little delicate to begin with, but once you get a grip on those you will find a game that rarely lets go. It is the smooth flight of the ship which is the real star and I’ve rarely tired of this aspect of Starlink. Scooting around and building up a map of each planet, whilst falling into random head-to-head encounters with bounty hunters, or the foes that make up Grax’s legions, allows the sharpshooter in all of us to come to the fore. The battles are fast and frantic affairs too, with ships and opponents duelling without a single hiccup. The whole thing is pretty smooth actually and no matter how many enemies you find yourself dishing damage out to, Starlink rarely fails to deliver. It’s not just all about the death and destruction of Grax’s race, the saving of your colleagues and taking control of each planet though, and much like any of Ubisoft’s other games, there are a whole variety of missions to complete, objectives to hit and secrets to hunt down. In fact, I’d hazard a guess to say that in order to fully nail this game, you’re looking at multiple tens of hours. 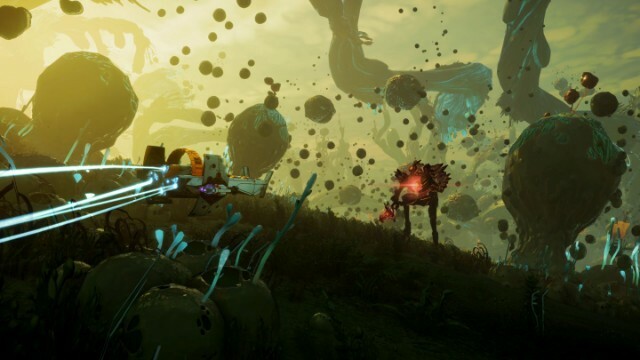 Of course, you don’t need to go all out to complete every single element that Starlink holds within, but the more alien hives you destroy, the extra puzzles you decide to try and complete, the push to take down wickedly tricky spires and their guardians and the more you help the inhabitants of each planet, the easier the overall fight to save Atlas will become. There are also plenty of other smaller objectives you can focus on too, and with a reasonably sized codex full of unlocks, it’s an utter joy to whizz around in the search for each and every secret that this galactic system contains. The highlight of these are being able to scan the creatures of each planet and whilst there are nowhere near enough weird and wonderful resident beasts that need hunting down and investigating, what is there will keep you busy enough. Occasionally you’ll need to whizz away from the surface of these lands to partake in a bit of travel between the different planets – and that of your mothership, the Equinox – but spending time in the darkest depths of space comes with its own dangers. 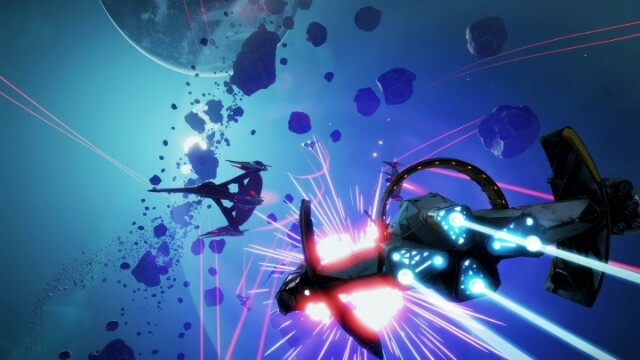 Space pirates lurk in these areas and no matter how good your ship skills, it won’t be long before you find yourself barrel rolling and looping as you go up against groups of hunters in space-fuelled dogfights. Honestly, this is most definitely the worst bit of Starlink and makes the whole travel between planets a tiresome affair, leaving you to pray that you can make the hyper jump to the nearest planet without being set upon. Maybe that’s just because the brilliance of the planet based gameplay is so good that anything getting in the way seems like a bit of a chore. However, for every side quest that you participate in, the more ship mods, cores, and skill upgrades you’ll get access to, allowing the chance to amend the skills and power of your pilots, ships and weapons. It could be said that these are thrown out a bit too easily, especially the weapon mods, but I’ve never been one to complain about a bit of help and am not going to start now. So that’s the gist of things in terms of the gameplay, but you’re probably wondering how on earth the whole ‘toys to life’ premise comes about. Well, with a controller mount, starship, pilot, variety of wings and whole host of weapons, attaching said ships to your controller lets you interact like never before. And each and every amendment you make to these toys on the fly will see the game coming across as slightly different. Need a quick ship in order to get away from danger? Sorted. Want a tank to allow you to go up against some higher ranked foes? Not a problem. Finding yourself struggling against an enemy that is susceptible to heat? Attach a flamethrower. Need something to take down that huge fire Cyclops? Grab a freeze ray. Want a specific combination in order to solve one of the many puzzles? Your wish is Starlink’s command – provided you have paid the required cash to get access to the huge array of modules that are available. The sheer variety that you can have in your weaponry is great and it really does ensure that Starlink comes across as a hugely customisable game, with each and every part being a cinch to fit and remove at a moment’s notice. No doubt some may not wish to go down that route, and many more may not want to have a hulking big ship stuck to their controller – and it does double the weight of the standard Xbox wireless controller when you have everything attached – but thankfully you can also play digitally. Now this works in two ways; you can either use the physical toys once, for the game to understand you own them and see them placed in your Atlas fight, or you can just purchase everything digitally. Of course, I guess Ubisoft could have gone down the standard game creation route and ensure that different ships, various weapons and each pilot were included from the get-go for one base price, but then we’d never have had the opportunity to run down the collection line. Variety is the spice of life and that is never more true than with Starlink. The problem with this route though is that it does all become a bit expensive, especially if you are struggling to take down some brute and need new firepower opportunities. Granted, Ubi have been kind enough to never really push the fact that new weapons can be bought, and at no point have I felt the need to keep switching in and out of machines, with a standard shooter, a frost-firing cannon and heat focused blaster all that you ever really need, but many more may want to utilise each and every weapon available. It’s also a bit of a pain to have this large ship attached to your controller at all times; the sheer weight of it really does become a strain in the longer sessions, whilst being able to hit the big Xbox button becomes a little tricky due to the main mount. 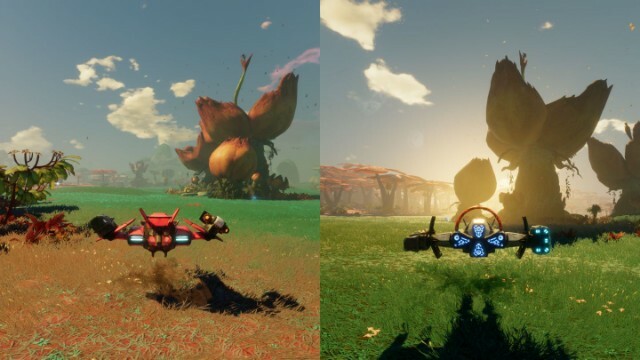 That said though I’ve hugely enjoyed my time with Starlink, but for as good as it is I want more depth to pretty much everything that is on show. Doing away with the rather tedious hyper travelling between planets would be all fine and dandy with me, but other than that I’d have preferred to see the game move forward a notch with just about everything else. You see, I want more alien creatures to scan, I want a larger variety of enemies to battle, I want a deeper side quest structure to get involved in, and I want just a bit more variety to the whole ‘fetch and retrieve’ idea that rules over the whole damn thing. If I’m really honest with myself, then I also want more ships, more weapons, and a bigger range of pilots – but then obviously the price point being asked for a full collection would start to get into the realms of the ridiculous. Nobody wants that. All of this can be taken in with a second local cooperative player alongside you too, with the action split down the vertical axis – this all works well, as long as the friendly fire option is switched off, because without that, 2-player Starlink gets a bit messy. It’s good that you don’t need a second mount for the other player though, with one being able to play digitally and just making the most of the ships and weaponry that have already been unlocked by the team leader. No matter what you may think of the whole toys to life idea that Ubisoft are pushing, the truth of the matter is that Starlink: Battle for Atlas is a very good game that should be embraced by all – with or without the physical additions. It brings together a great story, some utterly stunning visuals, and superb sound. These mix well with a variety of quests, missions, objectives and codex fulfilments that wouldn’t look out of place in the likes of Assassin’s Creed. In fact, rip away the outer skin and forget about the ships for a moment and much of the smaller ‘filler’ elements found in Starlink could quite easily have come from the recent Odyssey and Origins experiences. Yes it’s not as deep as those tales, but it doesn’t have to be and if you’re looking for a space shooter that provides something a little different, then Starlink fulfils much of what has been asked of it – physical toys or not!